I don't know about you, but my kiddos get into mischief faster than a speeding bullet. I swear they know the exact moment that my back is turned or that I'm just a tiny bit distracted. And like any good mom, I take pictures of them being naughty. I plan on making them a photo book of these moments when they become parents. I want them to know where there kids get it from. 1. Playing with Sugar-I would just like to put on record that my kids did this on Brett's watch. They poured out a 5lb bag of white sugar and a 2lb bag of brown sugar. My blood still boils over the fact that I bought said sugar on sale with a coupon for almost nothing and had to replace it at full cost without a coupon. Is this how you watch TV? Molly cries for the clothes that she throws out of her crib. EVERY!TIME! With Isabella I had to use duct tape to keep the diaper on. 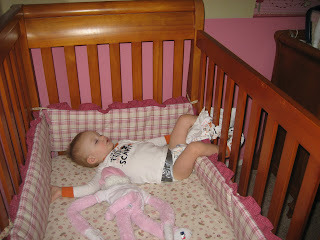 She outsmarted me in 1 week and managed to wiggle out of the diaper anyway. 3. Climbing - My kids love to climb and of course on things they shouldn't climb on. This picture is a classic for me. 4. Shame Eating - My kids just love to get into the pantry and fridge to get food without my permission. They really act like I starve them! One day I came out and found the freezer door open and knew to look under the kitchen to see what my kids were up to. Yep that's my girls eating ice cream under the kitchen table. I call it shame eating since they are hiding because they know they are doing something wrong. 5. Dumpster Diving - My kids love getting into the trash. As you can imagine, it makes me crazy!! My twins are the worst offenders. I find them in the trash less and less these days so I had to pull out an oldie but goodie to share with you. Do you take pictures of your kids being naughty too? And do your kids do these same things?